More than 10 times faster than a man with a broom! This manual floor sweeper combines productivity with value for money, and can be used to keep small to medium floor areas dust-free. WHY IS PICOBELLO 101 SWEEPER ROBUST & RELIABLE? The Picobello 101 sweeper structure is entirely manufactured in Eureka S.p.A. in order to ensure the highest qualitative standards. In addition, all containers are made of special robust ABS plastics. HOW TO REVERSE SWEEP? CAN I SWEEP BACKWARDS? Picobello 101 manual can sweep in both forward and reverse directions. Yes! Sure! Picobello 101 sweeper is amazingly manageable, it is agile in narrow spaces and works just as well over hard or soft floors, indoor or outdoor. It is quick, efficient and suitable for everybody. WHAT IS THE SIDE BRUSH FOR? The adjustable side brush is especially designed for effective sweeping in hard to reach corners and along walls. HOW TO ADJUST THE PICOBELLO 101 SWEEPER MAIN BRUSH? It is possible to adjust the Picobello 101 sweeper main brush thanks to the dedicated knob, this way the machine will easily sweep as well over hard or soft floors, indoor or outdoor. PICOBELLO 101 - THE MANUAL SWEEPER THAT COMBINES PRODUCTIVITY WITH VALUE FOR MONEY! Picobello 101 is a walk behind push sweeper with a total sweeping path of 730 mm which can sweep up to 2190 m2/h. Picobello 101 and can be used to efficiently sweep small to medium floor areas. Eureka Picobello 101 works just as well over hard or soft floors, indoor or outdoor. Agile in narrow areas Picobello 101 is 100% operator-friendly and suitable for a variety of applications. Ideal for the dust-free sweeping of industrial spaces, yards, parks, condos, sports clubs, parking lots, warehouses...etc. 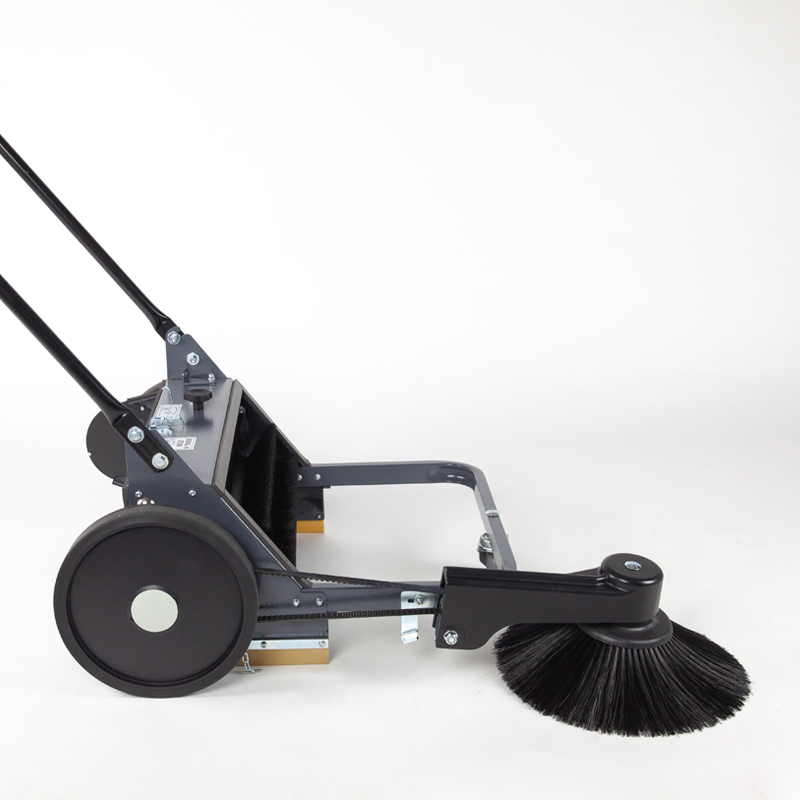 The Picobello 101 manual sweeper is entirely manufactured in Eureka and has a durable metal frame that is protected with anti-corrosion paint. The adjustable side brush, mounted on shock-absorbers, enables Picobello 101 to effectively sweep in corners and along walls. Picobello 101 works just as well over hard or soft floors, indoor or outdoor. Picobello 101 is mounted on large rear wheels with self-greasing bearings for better maneuverability. Large capacity, anti-shock front & rear dirt containers, enable the sweeper to collect either in forward or reverse directions. CAN JUST WORK AS WELL OVER HARD OR SOFT FLOORS, INDOOR OR OUTDOOR.